On Tuesday September 23rd, 2008, the Pitcairn-bound Braveheart picked me up in Mangareva, French Polynesia. 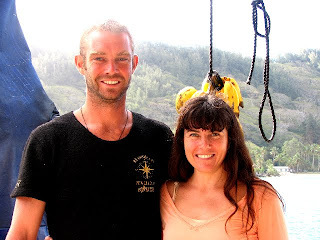 Captain Matt Jolly was a pirate/surfer-looking guy in his mid to late twenties with a constant smile and an assuring presence. Also on board were an optometrist (who was visiting for three days like me), Jacqui Christian (a pretty, confident Pitcairner in her mid-thirties), the rosy-cheeked Pitcairn school teacher coming back from vacation, an older woman from the Warren family (who was instantly wary of me - the journalist - and hardly said hello) and her teenage niece who was coming to visit family; all were arriving from New Zealand. Three more young and hip Kiwi surfer-types made up the rest of the Braveheart crew. The boat was much more comfortable than I'd expected. 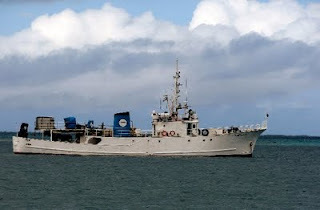 It's a sturdy 39-meter steel ship, freshly swabbed and with several cozy air-con bunks below. We got a tour, chatted with each other then, just as we began motoring away from port, went to the dining area for an early dinner. "Oh no not spaghetti again!" laughed the school teacher. "They serve this every time because they know it comes out your nose when you get sick." Everybody giggled knowingly. Now I get really, really seasick but I was determined to flex my strongest sea leg muscles on this trip. I'd taken some good seasickness tablets and decided that no spaghetti was coming out of my nose, no way. Still, the motion of the ocean was already getting to me and just the thought of barfing noodles made me queasy so I didn't eat much. The sun was setting and the lagoon was calm so I went up to the control room hoping to chat with the lively crew. Matt got out a picture album and showed me some of the other journeys the Braveheart has made: Antarctica, the southern Tuamotus, Kerguelen Island and more. The crew is into surfing, climbing, fishing and a slew of other adventurous activities and it looked like they were having a ball manning the ship even through mighty 16-meter swells in the Southern Ocean. Suddenly my life as a Lonely Planet writer seemed very boring. Just as suddenly, we left the lagoon and the sea got much rougher. Within about two minutes I knew that I'd better get to my bunk or I'd be spraying spaghetti all over my new super-cool friends. And that was it. For 36 hours I lay comatose in the dark listening to my i-pod and feeling like hell. I threw up once in the conveniently placed bucket next to my bed (no spaghetti out of my nose I'm proud to say), ate a few dry crackers with jam brought in by the crew and just meditated. When finally I felt the boat stop and heard some commotion I got up. 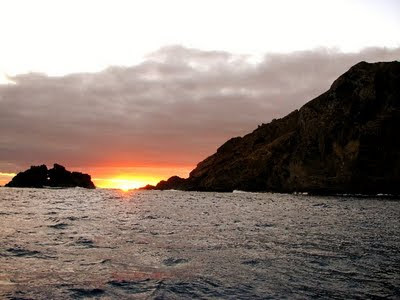 Up on deck the sun was just rising from behind Pitcairn, the air was crisp but warm, the sea dark but calm. The feeling of this moment is hard to describe. All I could think of was how the Bounty mutineers must have felt when they first saw Pitcairn and I wondered if they too first glimpsed the island at sunrise. Only the optometrist and I were on deck and we just smiled knowingly in silence. There we were, watching the sun come up at one of the most remote destinations on earth. Good day. You have a nice blog. And your photos are nice. Have a nice day. Radka.